Next time you drink yourself to zombie status, you can do it with the official beer of The Walking Dead. Terrapin Beer Company, which is practically located in The Walking Dead TV series' backyard in Athens, Georgia, which is just outside Atlanta, has announced they'll be brewing the official beer of the undead. 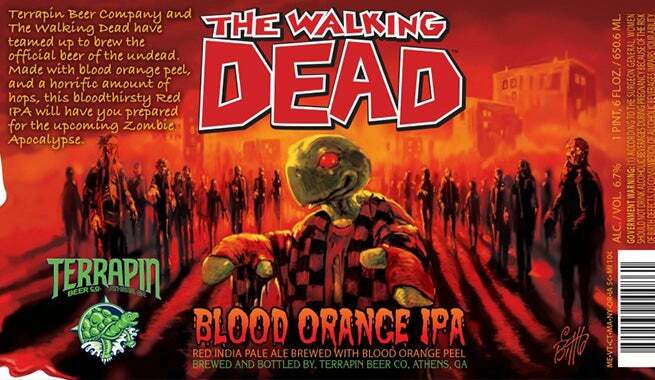 Terrapin Beer Company and The Walking Dead have teamed up to brew the official beer of the undead. Made with blood orange peel, and a horrific amount of hops, this bloodthirsty red IPA will have you prepared for the upcoming Zombie Apocalypse. The beer's logo matches that of The Walking Dead comic books rather than TV series, but it's all going to the same place, anyway. Terrapin Beer has actually been featured on AMC's zombie drama in the past, along with several other craft breweries, in the form of labeled boxes in abandoned shops and bars. The IPA with Blood Orange will be available in 22 oz. bottles or on draft and will be 6.7% alcohol by volume. An official arrival date has not yet been announced.